Receipts are those little sheets of paper that are handed by the cashier after payment has been made for the purchased products or goods. There are plenty of uses of a receipt and other uses that are specific to what type it is. 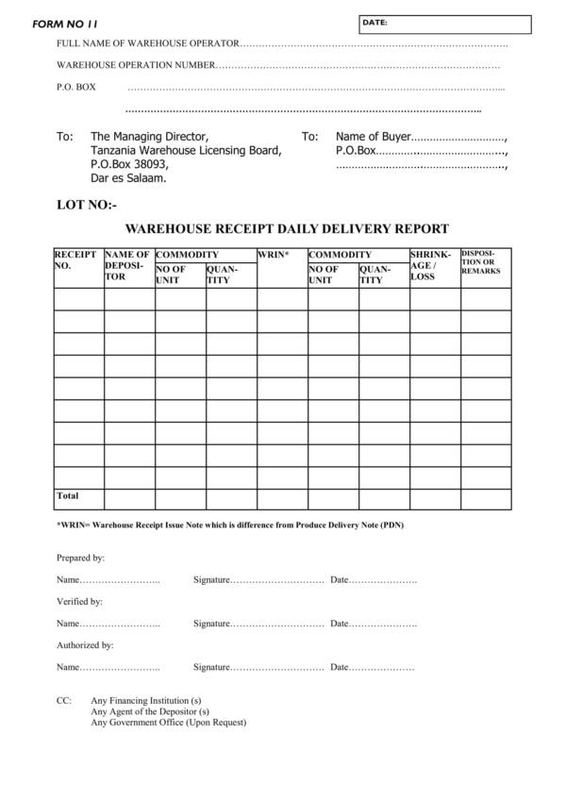 A receipt is primarily used as proof of purchase that payment has been made by the buyer and is acknowledged by the seller or the representative of the seller. In this article, we will discuss about a certain type of receipt called a goods receipt. What is this receipt and what is it used for. We will get to answer these questions and more as we go through the topic. Also, goods receipt samples and templates are provided to serve as one’s reference and may be used as one’s own receipt. You may check them out below. You would probably think that a goods receipt is similar to those receipts that we get from convenience stores or grocery stores. Who would suspect that it isn’t? Just the name itself would lead you to believe that it is another type of receipt that we use and encounter on a daily basis. Receipts are generally issued to acknowledge that one has received something in exchange of something of the same value. So when you make store purchases, your store receipt is an acknowledgement that the store has received the right amount of payment for the good that has been purchased. A goods receipt is also issued for the purpose of acknowledgement, but it does not really involved money or the receipt of money. It acknowledges the receipt of goods that are listed in a document issued by a warehouse, port terminal, shipping operator, etc. The items are inspected to ensure that they match those that are listed on the document. This is one way of legally conducting an inspection of the said products to know if they are really what they are declared to be. It is important that a goods receipt be secured, especially if is for business purposes as this is going to be part of the business inventory. 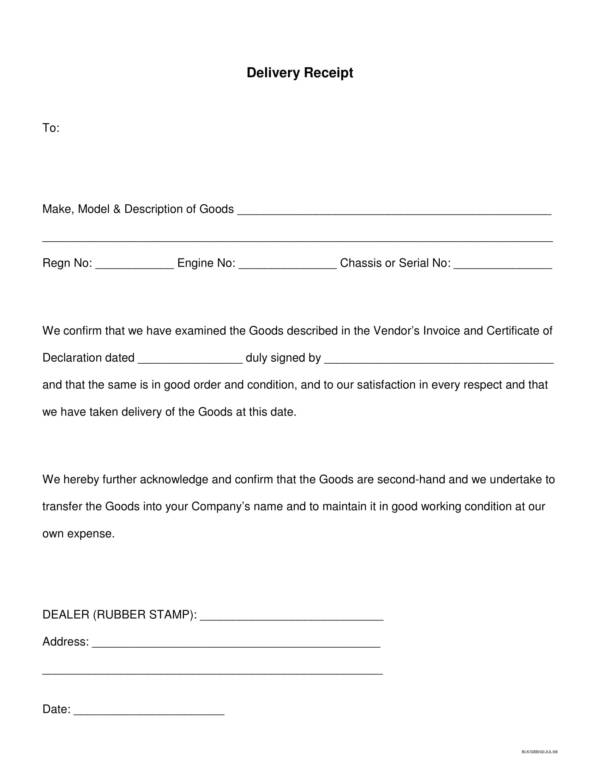 The items or goods listed in the document are also covered under specific terms and conditions. Other related articles you mat find useful are Loan Receipt Templates, Receipt Templates in Word, and Credit Card Receipt Templates. Receipts are often referred to as invoices and vice versa. This is because both of them are so similar that it would be hard to really find their differences just by looking at both pieces of paper. Well, if you just take a look at them you will really not find any defining differences. But if you try to learn a little bit about them, you will surely fins that little ray of light which sets them apart. Of course, we want to make things easier for you so we have here a list of the differences between a receipt and an invoice. Exactly when do you receive a receipt and an invoice? This is the most obvious difference that you surely won’t find out by just looking at it. Invoices are issued before payment for the sale transaction has been made, while receipts are issued after payment has been made. So if an invoice is issued before payment has been made, that is because it is use primarily to request for the payment of goods or services that has been consumed. What about receipts? as mentioned above, receipts are pretty much the acknowledgement that payment has been made. Because invoices are used to request for payment, you will probably not see the mode of payment used for the sale transaction, but you will have there the name, signature, age and even the date of the birth of your client. Of course that is on a case to case basis and largely depends on the seller and the type of business. While you are able to get see the mode of payment in a receipt, if it through cash, debit or credit card, or gift card, you will not be able to acquire such information as the address and age of the client or buyer. A receipt has its own receipt number that is unique and recognized by the store or establishment. Invoices also have their own set of invoice number known only to the business who uses them. Both receipt number and invoice number serve to determine if the products or goods purchased are from their store in case of a refund or repair. Invoices are not always paid right after they are issued to the buyer or client. There are certain payment terms that can be applied when it comes to paying invoices. Depending on what the buyer and seller has agreed upon as well as the total amount to be paid, payment terms can last a couple of weeks to a year. This type of agreement is not applicable to transactions done with a receipt. Can you see clearly now how receipts are different from invoices? There are a lot, but they are not as hard as you think they are. These difference can easily be spotted if you pay attention to the details. If you want to know more about receipts and invoices, you are welcome to visit our website. We have their articles with samples and templates, like Purchase Receipt Templates, Grocery Payment Receipt Samples & Templates, and Construction Receipt Templates. What Things Are Included in a Receipt? There are pretty much a lot of things that you can find in a receipt and all of them are equally important as all the other parts. The list below shows the things that are included in a receipt. The heading which, includes the name of the store or establishment, their address and contact number. The name of the company which the store is under is also provided. The date when the purchase was made as well as the date of payment is also listed. The list of items, products or services purchased or consumed are also included in the receipt together with their quantity, retail price and any promotions or discounts that are applicable to the said products. The receipt number or transaction ID is also indicated, which appears as a system generated set of numbers. The mode of payment of the transaction, if it is paid with cash, through credit or debit card or with a gift card. There are other acceptable modes of payment aside from the one’s mentioned, which depends on the store. The tax breakdown, including the tax percentage, and the total tax amount. The applicable discounts and promotions. Statement that tells about how long the receipt is valid. The name of the cashier and the checker, and their employee number. The time when the payment was made. Try checking out any receipts that you have and you will see the listed items above are in it. Some receipts may have less, and others may have more inclusions than the list which is normal as every receipt is unique. But you don;t really have to memorize all of them. Getting familiar with them works best. You may also check out other related articles, like Bill Receipt Samples and Templates, Store Receipt Templates, and Expense Receipt Templates. A goods receipt template can take on many forms and may contain a variety of different things. 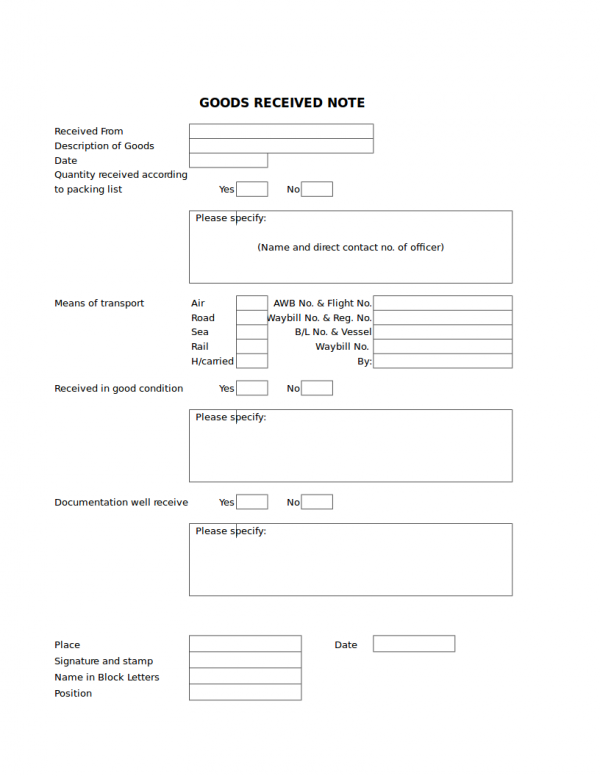 A good goods receipt template is one that appropriate for the types of goods listed and applicable for use for that particular transaction. Here are some simple steps that you can follow to create a simple yet useful goods receipt template. 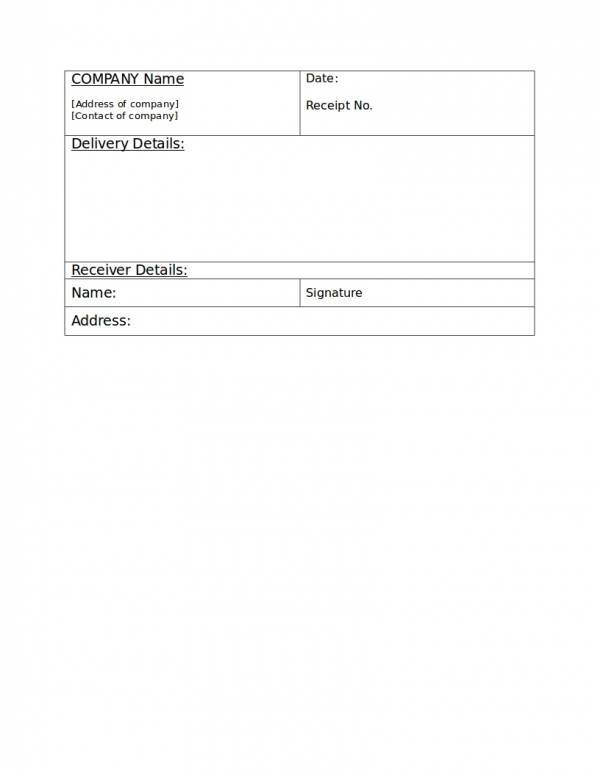 The first thing that you need to do is make an outline of the things that you will be including on your goods receipt. 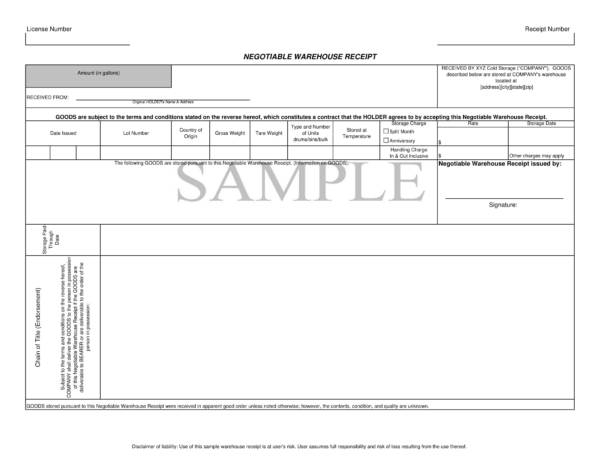 Goods receipt samples and other templates can help you with gathering the details that you need. The next thing to do is to decide whether how you want to make your template. 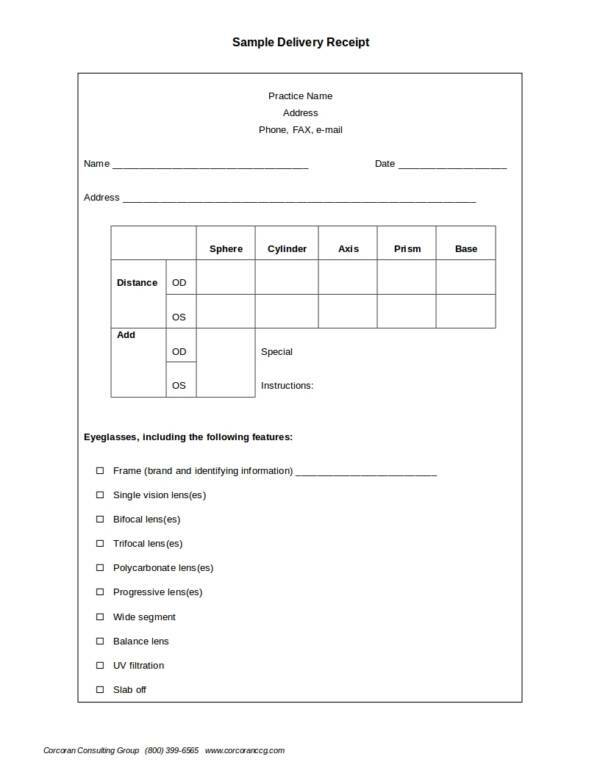 You can have it computerized using Word and Excel application, or create one manually with a pen, paper, and ruler. Prepare the things or the equipment that you need. Set the paper size, paper orientation and margin of your working document. 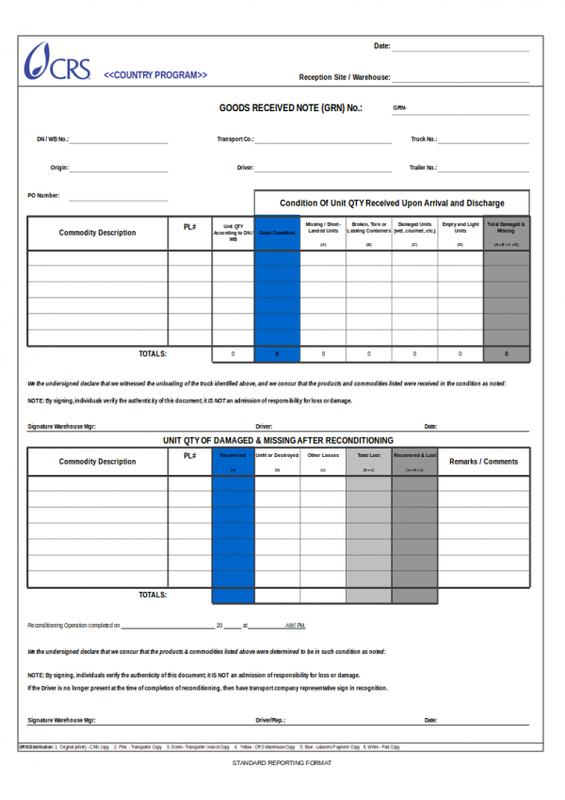 make sure that the margin is the same size for all of the four sides of your working sheet. This will make your document look neat and framed. 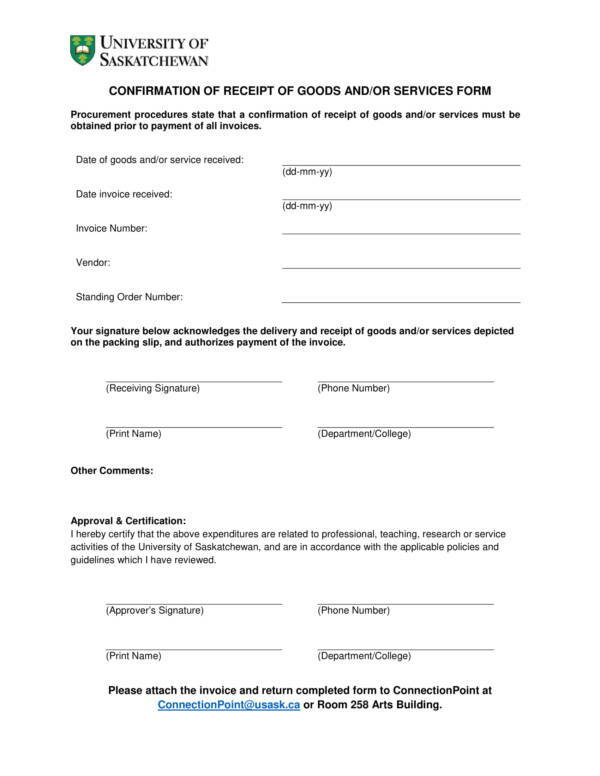 Start with adding the header or the logo of the company or institution who owns the goods and then followed by all the other important contents, such as the list of items, the date when the goods are received, the date when the invoice was received, the invoice number and the name of the vendor. 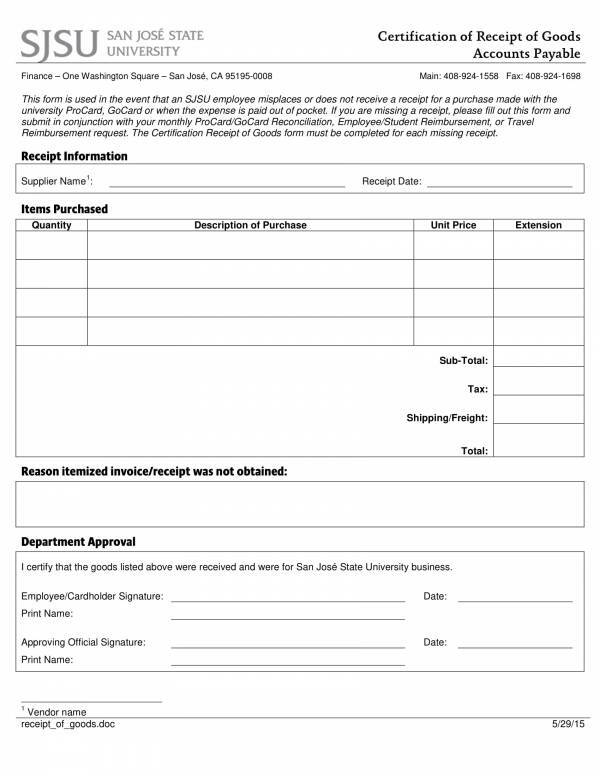 Make sure to provide an are where both senders and receivers can affix their signatures and write their full names. Also include other important statements, terms and conditions in the receipt template. 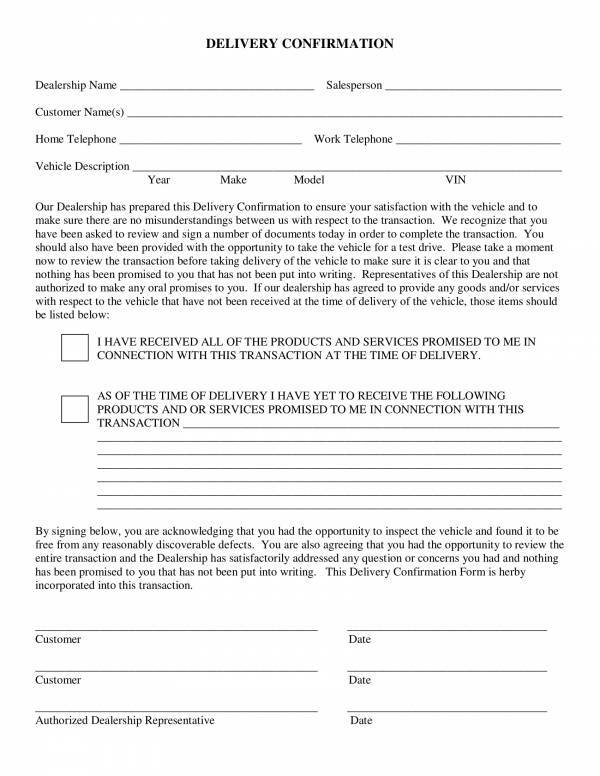 Mention any attachments or other documents that come the goods receipt. Proofread your work to make sure that there are no spelling or grammar errors, and so that the details you have are complete. When you are satisfied with your work, have it saved with your desired file name and keep for future use. 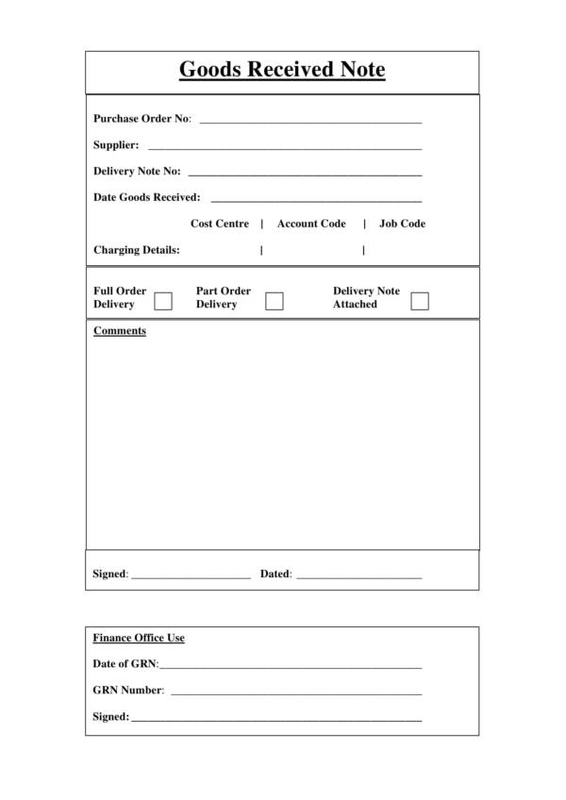 Existing goods receipt samples and templates will be a great help to guide you on what things you will need to include on your goods receipt template. You may check other receipt samples and templates on our website, namely Parking Receipt Samples, Petty Cash Receipt Samples & Templates, and Work Receipt Templates.